I don’t want this to come across and mean and cold-hearted, but Jeff Conaway’s death in no way surprises me, and quite frankly, I’m curious as to how he lived this long. Several weeks after being found unconscious in his Los Angeles area home, actor Jeff Conaway has passed away at the age of 60. According to reports, he had slipped into a coma after an accidental drug overdose. Conaway, probably best known for his role of Kenickie in the 1978 musical Grease (he was also on the TV show Taxi), made no secret of his decades-long struggle with substance abuse, and even appeared on Celebrity Rehab with Dr. Drew in 2008 seeking help to battle his demons. He was quite combative at the time, yet still seemed to have a genuine desire to kick his addictions to cocaine, alcohol, and painkillers. While Conaway’s coma has been blamed on a drug overdose, there is currently no solid proof that his death is directly related to drug use. According to Dr. Drew, Jeff’s body most likely simply gave out after long-term prescription drug abuse. The doctor went on to say that because of Jeff Conaway’s serious pill popping problem, combined with the constant abuse of other substances, his death was inevitable. 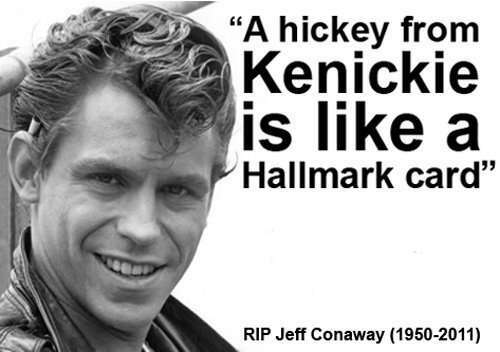 I hope Jeff Conaway has finally found peace.